What we have here is a woman with brown hair and a brownish red fez type hat with gold trim. She is wearing an off white long sleeve blouse with multi colored bottom trim with matching multi-colored trim on the ends of the sleeves. 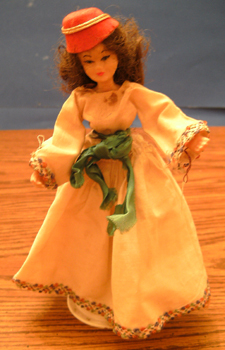 It also has a green fabric ribbon around her waist. She has painted on white boots with black bottoms and has a stand.